This is some text adventure creation software I've been working on. 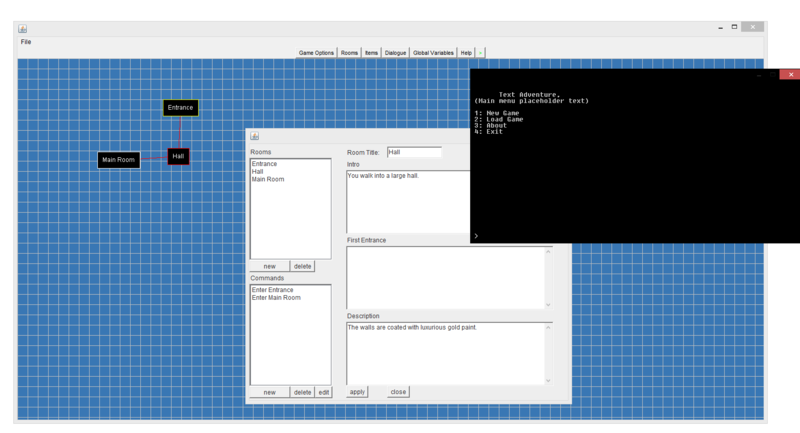 It almost resembles a finished project, although I might end up altering or redoing the command and scripting systems. I haven't made the help menu yet, so it might be a bit confusing, but if you do try it make sure you click apply a lot. Right now I it still has a few bugs, however these are mainly due to the bad implementation of a 'scripting' method I used in the game. Most of the commands start with an underscore (_), and so far some basic logic is included, and its main usage is to change rooms, add items and change boolean variables. All commands must be on their own line, including commands that take another command as an argument, e.g. repeat or if. As you can probably see, the script system is very crude, and any suggestions on how to improve it would be great. Also, any commands that link rooms together placed in a command will link it with the other room in the overview window. These can be moved around by dragging them, and red lines show the links of the currently selected room. Right clicking a room in the overview will open the editing menu for it. Click the green arrow to launch the game, or try to export it. Exporting the game should work, and it will create a folder containing the jar and the game data. - Creating dialogue and only having one dialogue option that does not link to another will trap the player in the dialogue forever. - Launching the game without any rooms may crash it, and will cause an exception. Any suggestions for improving it would be great. Very cool. Haven't tried everything yet, but it looks really cool and fairly easy in use. Nice work! I find it mildly amusing that your text based adventure game creation tool features a graphical map interface to help visualize the world you're working on within the editor. Although I would put this and the source on github if I were you. I've added a link to the source in github, but if anyone wants to look at it be warned, it is quite messy, and completely uncommented. You should wrap the text in the console and the text-boxes. It is very annoying.